The Bertin Instrument vision system for land vehicles is suitable for any cockpit: LTV, CAMPS, Helicopter at Grand. Depending on the vehicle, this reliable solution provides more or fewer camera modules, depending on the application. Our unique and ready-to-use solution enables special forces to see at any range of light when driving a military vehicle for several uses: from protecting infantry around the vehicle when visibility is very limited, to the detection of the enemy several metres away from the moving vehicle. CamSight is a lightweight and compact core camera to be integrated into complex optronic systems. 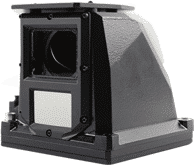 It comes in three versions, CamSight IR, for infrared vision, CamSight LP, infrared & low power, and CamSight LL including a color visible low light sensor.